Image from Hog & Rocks. From now through January 1st, ~HOG &AMP; ROCKS~ will be offering oyster and drink specials after you get off work and before you go to bed. They are serving $1 oysters Sun-Thu, and offering a $6 beer and shot special Mon-Thu 5pm-6pm and 10pm-1am, and Sun 5pm-11pm. Also note their new hours. You got all that? 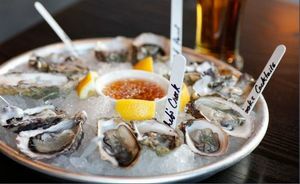 If there was a week to swing by ~WATERBAR~ for some oysters, this would be it. The person who orders the restaurant’s one millionth oyster will win a year of free oysters from Waterbar (a dozen each week), and everyone else at the bar will win a certificate for a dozen oysters, as well as a Champagne toast to celebrate. Yup, everyone will like you. It looks like it’s going to happen towards the end of this week—look for an announcement on Facebook and Twitter the morning they expect it to happen.